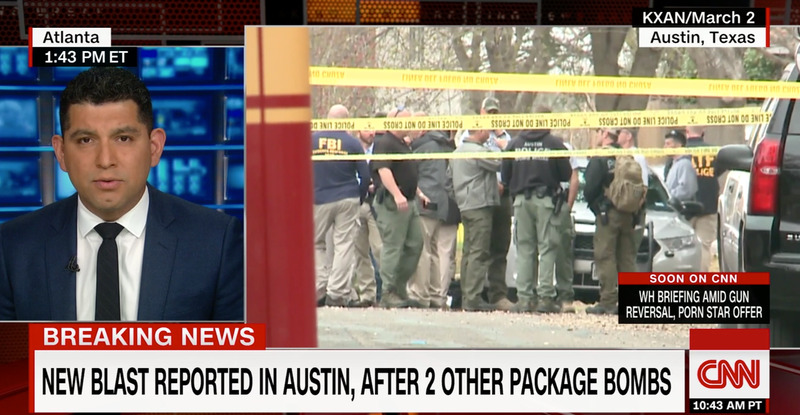 Police are investigating a series of package bombings in Austin, Texas. The first bombing happened on March 2, with two other bombings following on Monday. Two people have died so far. Police are now warning Austin residents not to open unexpected packages. Police in Austin, Texas, are warning residents not to open unexpected packages amid a spate of deadly bombings in the city over the past two weeks. The first explosion killed a 39-year-old man on March 2 when a package exploded on his front porch. Then on Monday, another package exploded at a home in another part of the city, injuring one person and killing another, followed by another explosion at a different location, injuring one more person. In light of the bombings, Austin Police Chief Brian Manley told residents to be wary. “If you receive a package that you are not expecting or looks suspicious, DO NOT open it, call 911 immediately,” Manley tweeted, asking others to spread the message. Police believe the bombings might be racially motivated, as two of the packages were sent to homes owned by African Americans. The packages don’t appear to have been delivered by any mail service, and were likely left on the homeowners’ doorsteps. Manley also warned at a Monday press conference that people should be wary of any package that has been left on residents’ doorsteps, yards, or driveways.